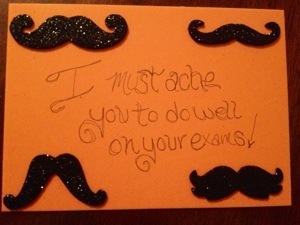 So it’s the end of the semester and my goal of sending my sister a homemade card each week fell ridiculously short. I figured I’d make up with it on the week of exams :) I’ve decided to send her a card for each day with a little silly joke or phrase. Here’s day 1!